Deliver a letter to Captain Aldis in Solitude. Speak to Gorm when he's apart from the Jarl. Deliver Gorm's letter to Captain Aldis in Solitude. Jarl Idgrod Ravencrone governs Hjaalmarch from her seat in Morthal. She is gifted with visions that seem to occupy most of her attention; she is less concerned with governing a people than she is with attending to her visions and passing on the wisdom she gleans. Her administration is under scrutiny as a result, as you will find out when visiting Morthal. If you speak to Gorm, Idgrod's housecarl, inside of Highmoon Hall he will be very solicitous of Ravencrone and her visions. However, if approached while away from the jarl he will reveal that his concerns are not just about her safety, but rather the condition her gift has left her in. He believes that she may no longer be able to adequately act as jarl of Hjaalmarch. Speak with Gorm while he is dining at Moorside Inn at 6:00 p.m., or while he is walking to and from Highmoon Hall. He will give you a letter to deliver to an Imperial Legion officer, Captain Aldis. Aldis can be found in Solitude at Castle Dour. Reading Gorm's Letter reveals that there is seemingly a plan in the works to remove Idgrod from power. Aldis, however, seems far less sanguine at the prospect of removing a sitting Empire-loyal jarl during wartime; but, he will take the information under advisement. He gives you 20 gold for delivering the letter. Counts for assisting people for Thane of Hjaalmarch. 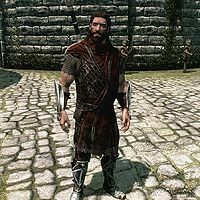 The only way Idgrod is actually removed from power in game is if the Stormcloaks take over Morthal. If siding with the Stormcloaks, this quest needs to be started before The Battle for Fort Hraggstad and finished before the Battle for Solitude to avoid issues. Also, Season Unending can transfer Hjaalmarch to the Stormcloaks; if that happens, then this quest cannot be started until Hjaalmarch is reconquered for the Empire. The related quest or objective may not appear in your journal. If you complete the Stormcloaks quest Battle for Solitude, Aldis will no longer be part of the city and the quest marker will lead to a blank floor, where Aldis previously stood. On the PC, it is possible to use the console to advance through the quest by entering setstage FreeformMorthalB stage, where stage is the number of the stage you wish to complete. It is not possible to un-complete (i.e. go back) quest stages, but it is possible to clear all stages of the quest using resetquest FreeformMorthalB.